The Speaker of the House of Representatives, Mr. Aminu Tambuwal, bowed out on Tuesday, handing over the leadership of the legislature to his Deputy, Mr. Emeka Ihedioha, who will round off the tenure of the House on June 5. 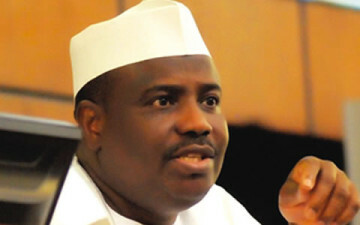 Tambuwal, who is the Governor-elect for Sokoto State, will be inaugurated on May 29 (Friday) as governor. His decision to transfer power to Ihedioha ahead of May 29 was to avoid a possible constitutional crisis of taking oath of office for two separate offices. While he will be inaugurated as governor on May 29, his current tenure as a member of the House will terminate on June 6. Tambuwal, who spoke with journalists soon after Tuesday’s sitting of the House, disclosed that the members agreed at an executive session that Ihedioha should preside over the affairs of the House till June 6. “My stay here in the House would have effectively come to a end on May 29 after I would have been inaugurated as governor. “We have to avoid any possible issues on this, since the constitution is silent on what happens when a sitting speaker has to move to another office,” he added. According to him, the 1999 Constitution does not envisage a situation where the speaker will leave one office for another, while the oath taken for the current one is subsisting. However, he noted that under the Standing Orders of the House, a Speaker Pro-tempore was required to be elected by members to run the House for any period the substantive speaker would not be available. But he explained that the extant case was different because he would not return to the House anymore. “At our executive session, a member came up with an ingenious way of dealing with the matter on hand, which members accepted. “He came up with the idea that the portion of the House rules in question should be suspended to enable the deputy speaker to continue to preside over the House instead of electing a new speaker,” Tambiwal added. Tambuwal stated that the other alternative would have been to shut down the House before June 6, but said he was not in support of such a move. “I won’t shut down the House. The House can sit tomorrow, Thursday and possibly the other sitting days of next week,” he said. Meanwhile, one of the contestants for the speakership of the 8th Assembly, Mr. Mohammed Monguno, on Tuesday voluntarily withdrew from the race. Monguno, who is from Borno State, said he was stepping down to back the candidature of House Minority Leader, Mr. Femi Gbajabiamila, one of the frontline contenders. Monguno added that he would instead join Gbajabiamila for the position of deputy speaker. Part of a statement he issued in Abuja reads, “After broad consultations and thoughtful consideration, I have decided not to run for the office of the Speaker in the 8th Assembly. “Instead, I give my full endorsement to my friend and colleague, Hon. Femi Gbajabiamila, who I believe has the requisite qualification to lead the 8th Assembly in the onerous task of addressing the important and pressing needs of the citizens of this nation. You will need to authorize this process.